Whew! One step down. 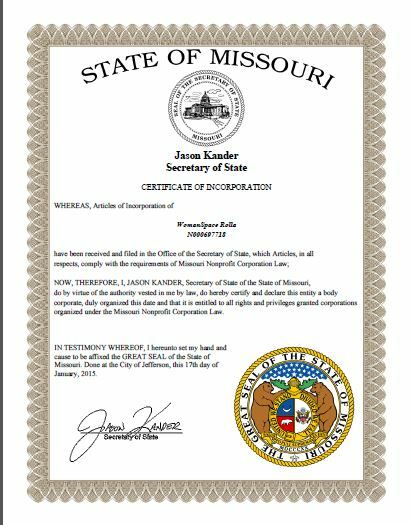 Today, WomanSpace Rolla became an official non-profit organization with the state of Missouri. Now, we’ll be meeting with a tax professional to answer some lingering questions on our vision. After that, the paperwork will be sent in to apply for 501(c)3 status. While a non-profit can exist without this specific status, it is helpful to have when applying for grants or accepting large donations where the contributor might like to receive a deduction. We’re still on target to open our doors February 3! Keep watching for more details. Tentative business hours will be Tuesdays 10am-4pm, Fridays 10am-4pm and Saturdays 10am-2pm. Classes and appointments may be held outside these hours. Some exciting projects in the works already include yoga classes, craft classes, “A Gathering Place” shop for purchasing local woman-crafted items (with a percentage of each sale going back to WomanSpace), and more! If you have an idea of something you’d like to present or see happen at WomanSpace, or if you are a woman-owned/woman-centered business, contact us today to see what we can do for you! Don’t forget to become a Facebook fan and share with friends. We don’t want anyone to miss out on the fabulous vison of WomanSpace. We are so very excited to see this coming together so quickly and are looking forward to a community full of strong, supported women!